A&M Records ‎– AMS 7461. 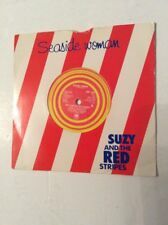 Suzy And The Red Stripes ‎– Seaside Woman. A Seaside Woman. B B Side To Seaside. Vinyl, 7", 45 RPM,Yellow. 10 Aug 1979. A: Diamonds On The Soles Of Her Shoes. Artist: Paul Simon. Catalogue Number: W8404. the sound, which is why we play testall of our records. So you know the sound quality of the record you're getting, not just what it looks like. 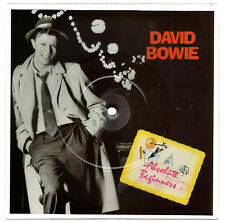 David Bowie - Absolute Begginers -. Catalogue Reference: VGS 838. 1986 - 7" Shaped Disk. Released: 1986. Country: UK. Good (G) – The record has visible mild scratches. The cover and contents suffer from folding, scuffing of edges, spine splits, discolouration, etc. Shrink-wrapped, but not sealed. Professionally cleaned on an ultrasonic record cleaning machine. Cover : Sticker tear to top corner (see photo). Cat No: TA 7233. Love Lies Dying. Label: Portrait. Condition: Vinyl Ex / Sleeve VG. Released: 1986. Country: UK. HARLEM SHUFFLE c/w HAD IT WITH YOU. ROLLING STONES. SLEEVE EX-. CONDITION MINT-. SAMSON Vice Versa - 1986 UK limited edition 12" vinyl Picture Disc single released after Bruce Dickinson had left and joined Iron Maiden, so is credited as featuring him. Also including Losing My Grip. Record Condition : Excellent. Sleeve : Excellent. I.D. Records ‎EYET 7. Record Condition : Excellent. Sleeve : Minor shelfwear (see photo). The Dio E.P. on Phonogram DIOP 710 labels with hand - etched DIOP 710 A ORLAKE and DIOP 710 B ORLAKE Matrices and Stickered PVC Cover . in lovely overall condition. Phonogram DIOP 710 label with hand - etched DIOP 710 A ORLAKE and DIOP 710 B ORLAKE Matrices. A Peter Gabriel & Kate Bush - Don't Give Up. B1 Peter Gabriel - In Your Eyes (Special Mix). B2 Peter Gabriel - This Is The Picture (Excellent Birds). Condition: record EXCELLENT plus: The record shows very few signs of having been played, and there is very little lessening in sound quality . (poly sleeve has light wear - see pic). Just arrived! NOTE: The audio quality of picture discs are not as good as black vinyl discs. RARE 1986: U.K. PRESSING. 1986: 7" Single. This is one of 10000 singles LP's, 12” and 7" that I HAVE COLLECTED OVER THE LAST 30 YEARS; they run from the 1950's to the 2000's and cover every style of music. GTR - When The Heart Rules The Mind. Catalogue Reference : GTR 1. 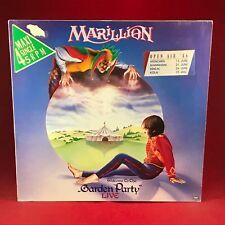 1986 UK vinyl 7" single. Country : UK. Grading as per UK Record Collectors' system. Plastic Sleeve: 'EX'. Photo Inlay: 'EX'. Our prices and grading are based on the record collectors guide. Grading are as follows Very Good (VG) VG records have more obvious flaws than their counterparts in better shape. They lack most of the original gloss found on factory-fresh records. Catalogue Number: BON5. the sound, which is why we play testall of our records. So you know the sound quality of the record you're getting, not just what it looks like. Record Grading: Ex-. This is why our gradings may be a little lower than our competitors - we don't simply inspect the record, but we listen to each and every one so you know the sound quality of the record - which is what really matters. KASPER RECORDS. 12" VINYL SINGLE. CATALOGUE / ISBN NUMBER. ( As shown to vinyl, label or sleeve ). OUR VINYL GRADES. RECORD LABEL. May play with odd bit of light background noise. May play with a little mild background noise. GTR - When The Heart Rules The Mind. 1986 German vinyl 7" Juke Box Vinyl single. This is one of 10000 singles LP's, 12” and 7" that I HAVE COLLECTED OVER THE LAST 30 YEARS; they run from the 1950's to the 2000's and cover every style of music. The Pleasure Cell - 1986 Ireland Self Released 7" Single. Sleeve: 'EX'. Record: 'EX'. Labels: 'EX'. Razorcuts - Sorry To Embarrass You EP UK 1986 Subway Records 12"
Razorcuts - UK 1986 Subway Records 12" Single. Matrix number: Subway 8T. Grading as per UK Record Collectors' system. Label: Fon. Cat No: SED 2. The Mighty Device. Condition: Vinyl Ex / Sleeve VG. Released: 1986. Country: UK. Artist: STRANGLERS. Label: EPIC. Country: NETHERLANDS. Year: 1986. ALABAMA - She and I. Rare 1986 US RCA 7" Vinyl Single. Artist: Bryan Ferry. Bryan Ferry -. Is Your Love Strong Enough?. - 7" Record Single. the sound, which is why we play testall of our records. So you know the sound quality of the record you're getting, not just what it looks like. PERILS OF PLASTIC - Womanhood. Original 1986 UK I njection moulded 7" vinyl single. This is one of 10000 singles LP's, 12” and 7" that I HAVE COLLECTED OVER THE LAST 30 YEARS; they run from the 1950's to the 2000's and cover every style of music. Bronze ‎BRO 92. Record Condition : Excellent. Sleeve : Minor shelfwear (see photo). Stone Dead Forever 5:54. LABEL:ELEKTRA EKR 37. " IN MY DREAMS ". POOR: The record will not play properly due to scratches, bad surface noise, etc. BAD: The record is unplayable or might even be broken, and is only of use as a collection-filler. BERLIN - Take My Breath Away. 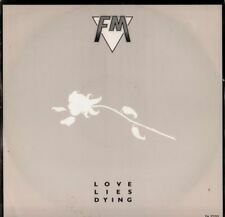 1986 German 7" vinyl single. Country of origin : German. This is one of 10000 singles LP's, 12” and 7" that I HAVE COLLECTED OVER THE LAST 30 YEARS; they run from the 1950's to the 2000's and cover every style of music. BERLIN - Take My Breath Away. 1986 UK 7" vinyl single. This is one of 10000 singles LP's, 12” and 7" that I HAVE COLLECTED OVER THE LAST 30 YEARS; they run from the 1950's to the 2000's and cover every style of music. PHIL FEARON - Ain't Nothing But A Houseparty. 1986 UK 7" vinyl single. This is one of 10000 singles LP's, 12” and 7" that I HAVE COLLECTED OVER THE LAST 30 YEARS; they run from the 1950's to the 2000's and cover every style of music. Autographed Sleeve as wear, creasing and split along opening. STATUS QUO - In The Army Now. Catalogue Reference : QUO 2012. This is one of 10000 singles LP's, 12” and 7" that I HAVE COLLECTED OVER THE LAST 30 YEARS; they run from the 1950's to the 2000's and cover every style of music. A: Rock The Night. Catalogue Number: EPC6501717. the sound, which is why we play testall of our records. So you know the sound quality of the record you're getting, not just what it looks like. This is why our gradings may be a little lower than our competitors - we don't simply inspect the record, but we listen to each and every one so you know the sound quality of the record - which is what really matters. Artist: Clannad. Catalogue Number: PB40535. the sound, which is why we play testall of our records. So you know the sound quality of the record you're getting, not just what it looks like. This is why our gradings may be a little lower than our competitors - we don't simply inspect the record, but we listen to each and every one so you know the sound quality of the record - which is what really matters. Spandau Ballet. Through The Barricades. Cat No: SPANS Q1. Label: CBS. Condition: Vinyl Ex / Sleeve VG . Released: 1986. Country: UK. Released on Reception Records REC 002 in 1986. on rare original UK 1st pressing 7" in picture sleeve with paper labels. The Wedding Present. 'Once More' & 'At The Edge Of The Sea'. Here I have a copy of. HUEY LEWIS & THE NEWS - Hip To Be Square. Catalogue No : HUEY 6. Scarce 1986 UK 7" vinyl single. This is one of 10000 singles LP's, 12” and 7" that I HAVE COLLECTED OVER THE LAST 30 YEARS; they run from the 1950's to the 2000's and cover every style of music. HUEY LEWIS & THE NEWS Fore! 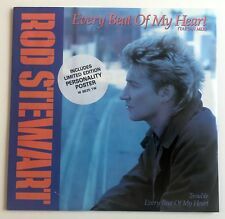 - 1986 UK vinyl LP, complete with lyric inner CDL1534. The Power Of Love. Record Condition : Excellent. Cover : Excellent. Forest For The Trees. Small world (part one). Simple As That. In a glossy 'Spitting Image' picture sleeve. Record Condition : Excellent. Cover : Minor shelfwear (see photo).